For Women’s Office Wear, Who’s Making the Rules? Professional dress was created with the male worker in mind, and the unclear guidelines facing women shows we haven’t fully accepted them in the workplace. It’s summer, and it’s hot, so women are now plunged into the murky waters of dressing appropriately for work, while not wearing so much clothing they’ll get heat stroke. Some, like a reporter who was thrown out of a courtroom for having bare shoulders, will cross a vague line and get penalized. When women dress themselves for a professional setting, from prominent politicians to eager interns, they’re trying to conform to an unspoken set of rules that were crafted with men in mind in the first place. The gender policing of clothes was even stricter before it was widely acceptable to have women in the workplace at all. In 1960, Lois Rabinowitz, a secretary who went to a courthouse to pay her boss’s speeding ticket, was ejected for wearing slacks and a blouse. As Gail Collins relates in When Everything Changed, women were arrested for walking around in slacks on the street at night. For any women who did work, the professional dress code was “stockings, heels, gloves, and hats.” But really, women weren’t supposed to have careers, and they weren’t supposed to wear pants: the lines were very clear. Women can now wear pants without fear of retribution, and women who work have become the norm. But clothes are still a tricky issue. In the 1970s, when women started making more inroads into the workforce, they had to figure out how to adapt men’s business attire, namely suits, to their bodies. At first they wore big bows in place of ties. Women in the ’80s donned suits with enormous shoulder padding. This was the age of the power suit: “a suit that exaggerated a woman’s shoulders, giving her a more aggressive and masculine silhouette,” as defined by Vogue. Office attire was meant to make women look more like men in suits, rather than to find a kind of dress that was both professional and feminine. Today, clothing companies seem to have figured out how to design suits and work clothes for women’s bodies. But women’s choices still come fraught with tripwires they might not even know are there. Is your clothing too brightly colored? Do you leave the collar of your shirt out of the suit jacket or tucked in? Skirt or pants? You should wear heels, but not stilettos. You shouldn’t look frumpy, but don’t dare show cleavage. Don’t “dress like a mortician,” but also avoid your “party outfit.” Wear a nice suit, but not always an Armani one. Not to mention the invisible line separating dowdy and slutty. Hillary Clinton, whose fashion choices never cease to fascinate us, is a living example of how difficult it is to chart these waters: for so long chastised for dressing in sexless turtlenecks, she got an entire article written up the one day she showed a very small amount of cleavage. The fact that women are faced with an unclear dress code while men know what they should wear—a suit if it’s a formal workplace, dress shirt and pants if it’s business casual—is one more sign that the workplace has still not totally dealt with the fact that women will be half of the inhabitants. That we endlessly discuss female politicians’ fashion choices and single out female employees for their clothing faux pas marks them as aliens entering someone else’s territory—they are an other, an outlier, and their clothing is one more reminder of that fact. Our fashion choices aren’t just frivolous. They have a big impact on how we’re perceived. A study in 1985 found that female interview subjects were significantly more likely to be viewed favorably for hire if their clothes were seen as more masculine. 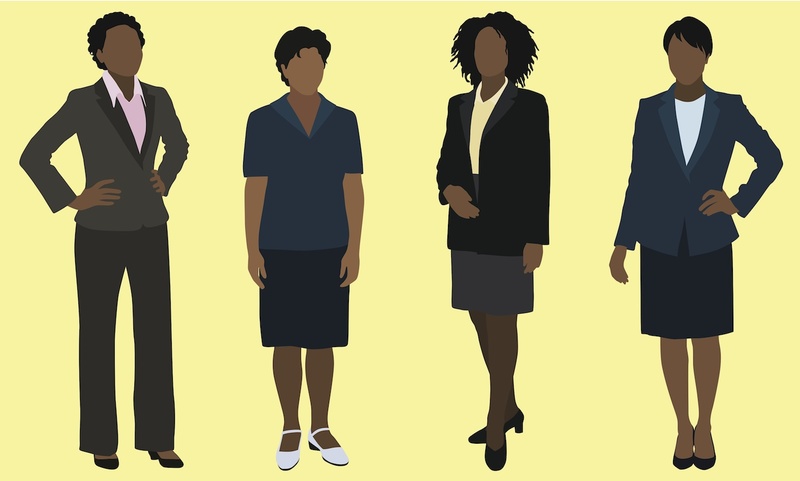 “[F]emale applicants’ clothing is an avenue for influencing the selection decision for management positions,” authors Sandra Forsythe, Mary Frances Drake, and Charles E. Cox concluded. Forsythe followed up with a study in 1987 that found that more masculine clothing conveys more masculine managerial traits. The perception of a woman in her workplace can be influenced by everything from how much makeup she wears to her hair length. There are plenty of more obvious and perhaps more detrimental ways that the modern workplace still hasn’t adapted to the entry of women (and thus two working parents). Few workers get paid family leave for a new child or paid sick days to care for an ill kid. Childcare is still prohibitively expensive and yet often of very poor quality, so it’s unclear what parents are supposed to do now that June Cleaver isn’t home. And women keep coming up hard against the glass ceiling. But it’s a telltale sign that we still haven’t figured out what they’re even supposed to wear to the workplace. Just 16 percent of parents think it’s best for children to have a mother who works full-time. Have we accepted the idea yet that women are going to work either out of necessity, passion or both? If so, we might want to come up with some clearer ideas of what they should put on in the mornings.